Olympia Time: Property is in fact more valuable in Lacey. Go figure. Property is in fact more valuable in Lacey. Go figure. Ken has a very Ken-esque post about how he's totally okay with moving the county courthouse, but on as long as it lands in Lacey. Or, in fact, move the entire county seat. Olympia is old hat at retaining titles like county seat, or say, state capital, so I'm not worried. But, also with his post, he makes this bold statement: "Land is cheaper in Lacey." Well, okay then, I can take a look at that. First, let's think about why he might say that. Sure, Olympia is a much older city with nice(r) neighborhoods and some pretty great shoreline properties. But, when you get up into the Hawks Prairie north end of things for Lacey, the neighborhoods tend to get much nicer and much newer. So, maybe its a bit of Lacey "aw-shucks, look at us, we're so cheap?" I don't know, but either way, the numbers don't seem to stand up his point. First, looking at recent home sales from Trulia data, there isn't a very big difference between sales of house in Olympia and in Lacey. 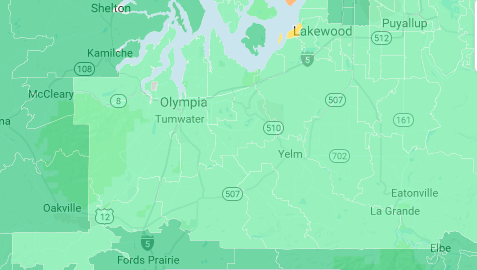 Even when I clear away all the other data in the original Trulia map, the main three zip codes in central Thurston County are pretty much the same. Maybe Olympia is a bit higher, but since 98501 isn't just Olympia, it's hard to tell. Also, this is home sales, which may not be a good guide for the type of land that a courthouse could be built on. So, I tried to find a way to figure out total land value of each city. Good thing we have a county official whose job that is. Before you give me the lecture about "assessed value not being actual market value," find a way to figure out an actual market value city-wide. Also, even if assessed =/= actual, it is still likely a good estimate when you're comparing values between two cities.